Materials: Black/gray/anthracite cast iron base. Plastic and rubber, metal inside. Aluminium reflector. Porcelain G4 socket. 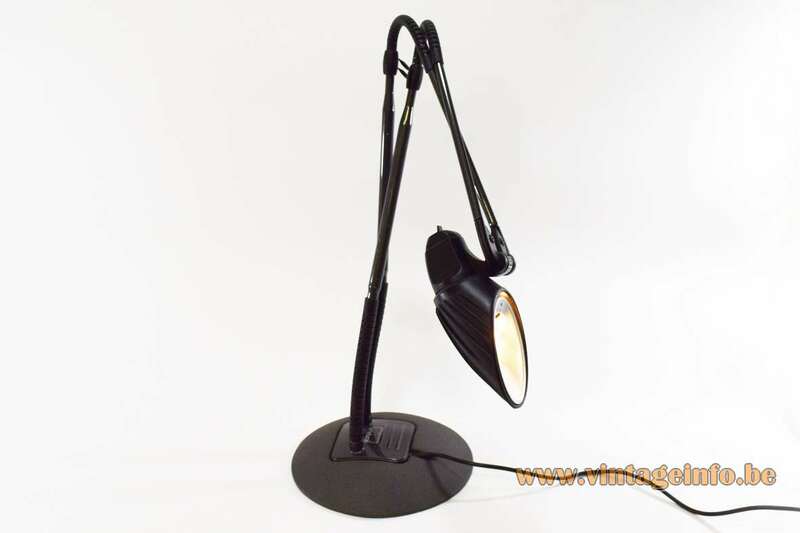 Electricity: 1 bulb G4 Halogen, 1 x 50 watt maximum, 12 volt/220 volt. Designer: Stephan Copeland (born 1960). Other versions: Also made with a blue lampshade and made in grey and grey with white. 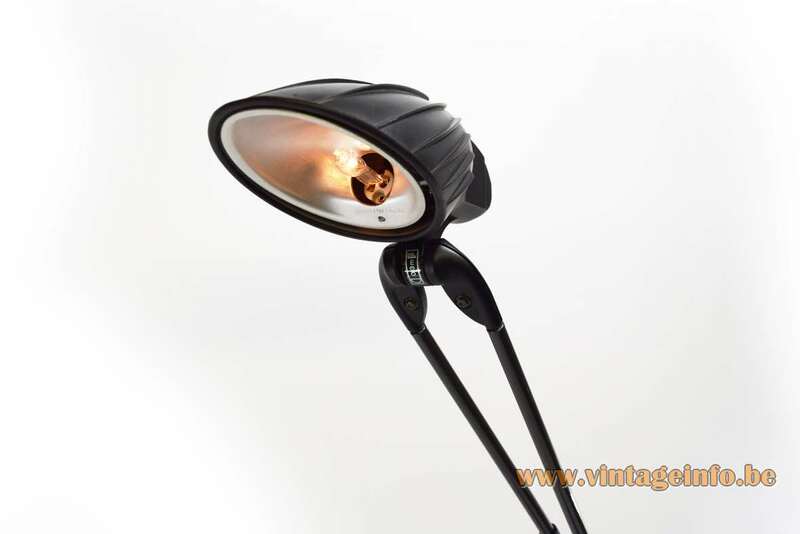 These lamps have an external transformer that produces both 6 and 12 volts. The switch can thus be set to 3 positions. Low, high and off. Stephan Copeland was born in Montreal, Canada in 1960 from Irish parents and currently works in New York. Copeland has won several awards and been wildly published and exhibited for design innovation. 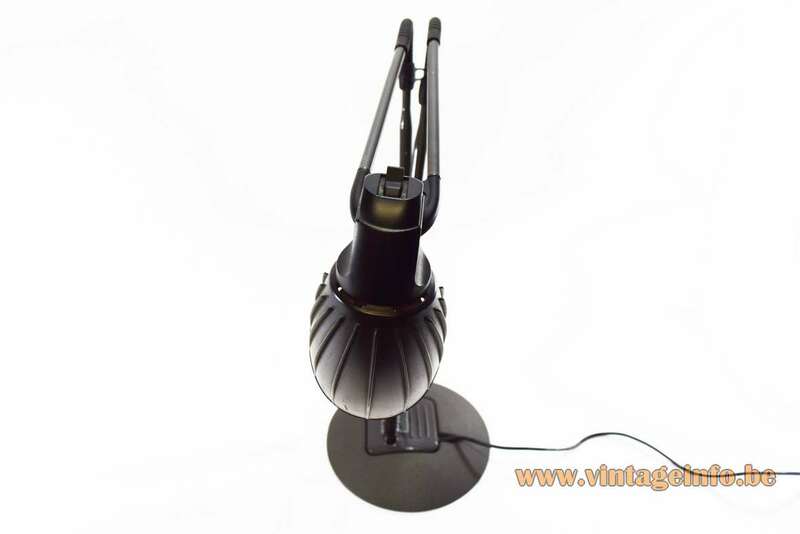 He designed for FLOS, Knoll, Herman Miller, NASA and many more. 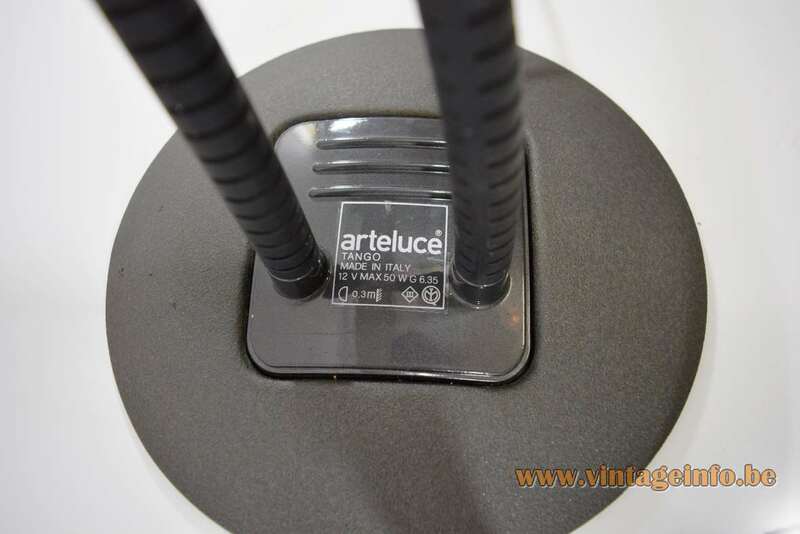 Arteluce was a lighting and interior design company and it was founded by aeronautical engineer and modern lighting pioneer Gino Sarfatti in Milan, Italy in 1936. 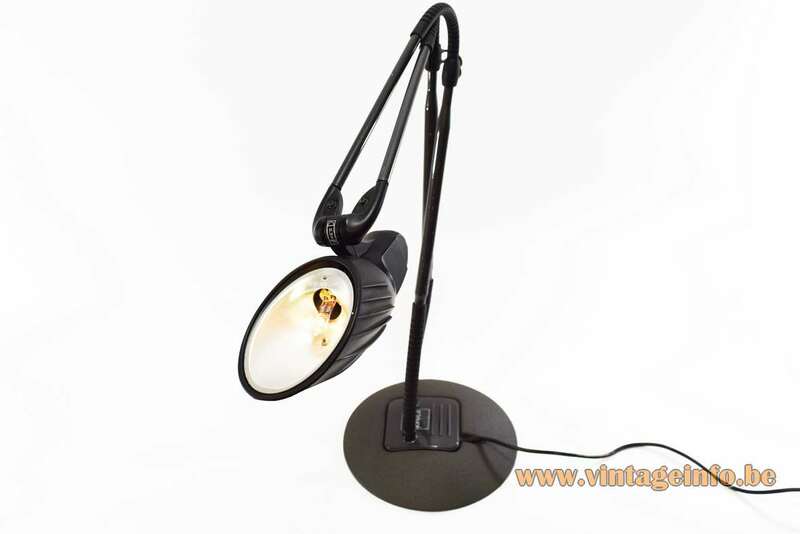 In 1974 the company became a division of Flos. FLOS was founded in 1960. 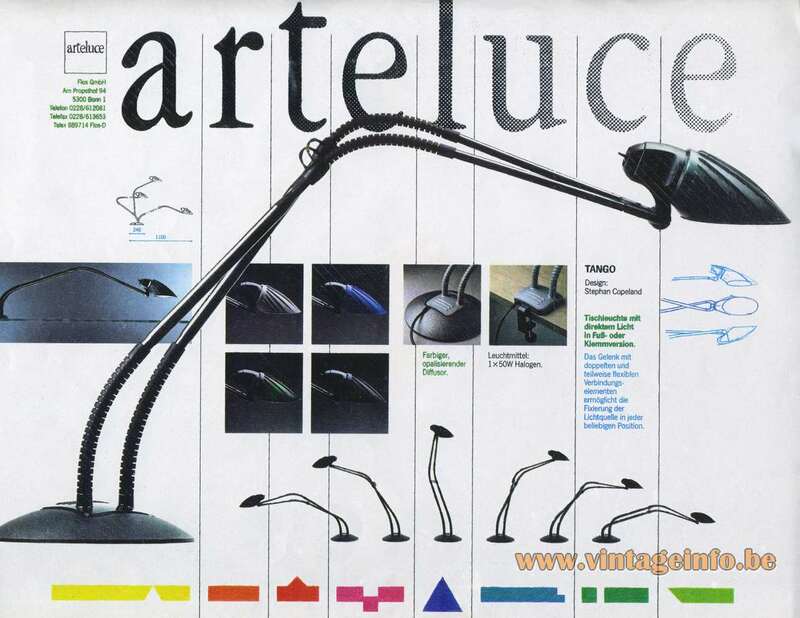 The company was born as a small workshop in Merano, where new materials were experimented, and new stylistic and functional researches, when Dino Gavina and Cesare Cassina collaborated with an important importer of an innovative polymeric coating (Cocoon) produced in the United States: Arturo Eisenkeil. The Eisenkeil company is still located in Merano (or Meran), South-Tirol, Italy. The seventies were years of great creative and entrepreneurial ferment. The company rapidly grows and opens its first subsidiary in Germany. In 1974 FLOS acquires Arteluce, the company founded by Gino Sarfatti. As result, several models designed by Gino Sarfatti have been incorporated into the range of FLOS products. In the nineties, FLOS decided to create its own spin-off called Light Contract, a division specialized in the production of professional products and lighting systems for large commercial spaces. 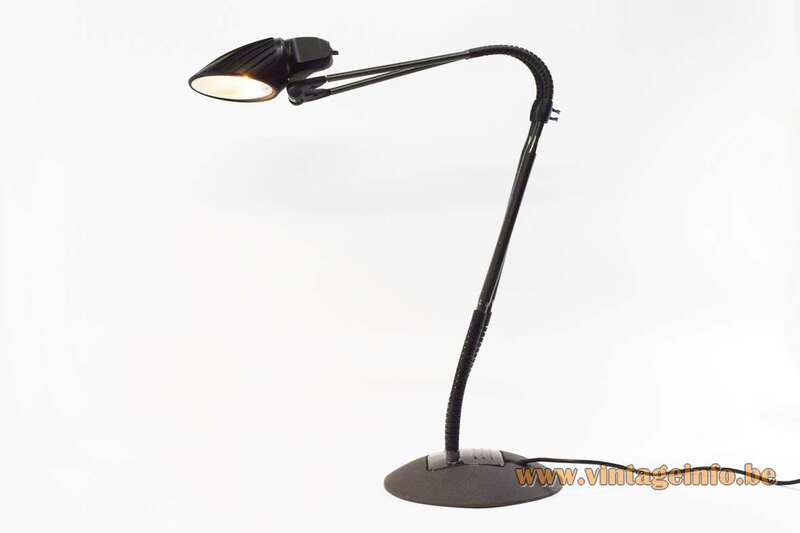 Nowadays FLOS is still one of the leading companies in its sector.